I was listening to a Tyrone Davis classic, “The Turning Point”, (if you’re under 40 you might not recognize this singer or the song) and it got me thinking about some of the turning points in my life. I remember the day I started school, a little brown girl in a beige dress; stepping up on that big yellow school bus and becoming a student, scary, but I moved forward. I remember the day I passed my ex-husband in the hallway of the church (I was 14) and thought “he’s cute, that’s going to be my husband; another scary moment, but it felt right at the time. Those moments lead to change, both the good and bad, those are your turning points. I can recall some of those moments very clearly, right down to who was in the room and what I was wearing….some I’m proud of and some not so much (don’t ask). These turning points are the real milestones of our lives, at times more so than birthdays, anniversaries, moving to new locations, or new careers; they instigate real change. Turning points don’t have to be major “AHA” moments…they can be so subtle that you don’t realize a change in your being has taken place. For example…I was sitting on my couch in my living room on a sunny Chicago day, my front door was open and my daughter in law was visiting. A Victoria Secrets catalogue arrived…we looked through the catalog and there was a cute but not overly impressive crochet dress listed. That day I was dared to recreate this dress. It wasn’t the challenge of actually making the dress, it was the dare that had more of an impact. Little did I know, that moment would be a MAJOR turning point in my life. It was the moment that birthed KnottyLoop. It was a simple moment in time, an unrecognizable turning point, but a major change took place in my life. When you think back or look forward, recognize that turning points are consistently happening. Every opportunity or turning point doesn’t happen by luck, some are targeted, championed and executed. If you recognize the moment, seize it and convert it into an opportunity to alter your destiny. I’m really trying to work mine! And don’t worry, I’m still working my list: writing my patterns, creating new designs, scouting locations for our first meet and greet, traveling to new destinations-I just left Kentucky, where I had a great reception, keeping busy! So what is your next project? Please don’t tell me you don’t have one. Whether it’s creating with yarn, a new exercise program, a room addition, painting a flower stand, or reading a book…you have a project in mind to complete. Share your project, I promise someone will be inspired! I really want to use this newsletter and social media, not only to promote my business, but also to encourage like-minded souls to inspire one another. No project or idea is too big or too small to share. I made some progress on my pattern writing and working with the photographers to make sure that I have supporting photos. I started sorting my yarn…it’s worse than I ever dreamed….someone handcuff me to my chair and keep me out of the stores! And yes, I had to move back 5 squares! I lost points within days of challenging myself to stay out of the stores…doggone Joann’s for their Coupon Commotion Promotion. I’m doing better now, and I have moved forward a few squares by pulling from my yarn stash. I have some GREAT yarns that I totally forgot about…excited as day one!!! Headway into writing my pattern book? I’m looking for the right publisher, so not as much as I would like…it’s been a busy month. I need to make some connections to help me on this one?? If you have information please share. Facebook and Instagram posts….I’m back. I will keep you up to date on what I’m working on. Travel….on Nov. 7th I’m headed to Louisville, KY (did y’all think I was kidding). Looking forward to working with the ladies of the Jack and Jill of America, Inc. (details below). Come on East Coast / West Coast / Midwest send me the info for events / fashion shows and I’ll take it from there. Remember with every project; treat it as the first. Go in with nervous excitement knowing and accepting that things might change mid-project. Remember that every project is a learning experience that takes you into the next great journey. Some of you might know that I lost my mom, Clearetta Smith, in September of 2013. She was my mentor, teacher, shopping companion and friend. Has it thrown me off my game? 100% Yes!!! Mentally I’ve been on leave and working as if running in mud. Last week I had a thought which manifested in her voice asking me “Lisa, what are you doing? Stop being half-assed and get to work!”. The very next day one of my followers sent me a note which simply said “We miss you”. I thought to myself “I’m here, right here”. I’ve been functioning, and going through the motions; posting, but not wholeheartedly…In essence, I’ve been absent in your presence. I always tell people, “when you come to a roadblock, move to action”, but I haven’t been taking my own advice. The only way to overcome an obstacle of any kind is to move…while moving most times you will come in contact with just the right advice, the right contact, or the right information that will help you remove or lift your roadblock. It’s time for me to take my own advice. I’m going to put every effort into not just being present, but getting back on my game. So what does my game board look like? What is my next move? Square 1: Must write patterns – I OWE folks the patterns that I’ve been promising for 3 years…they are coming. For every pattern completed, move forward 2 squares. Square 2: Must complete at least one NEW design weekly – I’ve got 10,000 new designs floating in my head….gotta get them out….go back 2 squares if not completed. Square 3: Sort my stash – OMG!! OMG!!! I need to stay out of the stores and get off the internet! Before I order one more skein of yarn, I’ve got to use more of what I have. Time to create. Move forward 1 square for every skein of yarn used that is already in my stash. Move forward 3 squares for staying out of the stores! Square 4: Get published. Not only do I want to write some individual patterns, I have an idea for a book that I need to get published. Move forward 5 squares when I get published! Square 5: Get back posting – I miss interacting with fellow crocheters, loyal and new customers, and those who just appreciate the art. The feedback helps generate new ideas and I miss y’all too. Square 6: Knotty Loop needs to travel – East Coast / West Coast be on the lookout. If there are any shows (fashion shows, festivals, or vending opportunities) that you think would be a good fit, I’m open!!! Send me the contact information and I’ll take it from there. Square 7: Get this Newsletter out monthly (and on time) by the 15th of each month. Square 8: Youtube videos/tutorials….These should be fun!! What do you want to see? Square 9: Host a crochet brunch….Let me know if you’re interested. Just a few hours of the day spent crocheting and exchanging ideas – maybe once a month. I’m going to try to keep moving forward and shake off this stagnating mammoth that has been laying on my creative spirit and get back to being me. I know my mom will walk beside me every step of the way – smiling!!! Chicago, IL – Get tickets! According to the dictionary, a noun identifies a person, place or thing. Throughout life, if you were to ask me, I would’ve associated myself with a noun. On January 1st of 2012, I took on a resolution for fun…crochet 366 items in 366 days (it had to be a leap year). Who would blame me if I didn’t make it? The thing that I realized in accomplishing this, was that I was able to move to action. I worried about sacrificing relationships with family and friends at the start, but I learned to incorporate crochet everywhere I went. As usual my family and friends rallied behind me and gave unyielding support. Crochet became my focus and my drive. The closer that I got to the end of the year, the more compelled I became to make it happen. This challenge helped me realize that I’m more than a person. I am an ever evolving, thinking, LEARNING, shifting, modifying, emerging, producing, nurturing, maturing and flourishing INDIVIDUAL. I am a woman in motion; I AM A VERB. I truly want to give special thanks to all who stopped by, left comments, challenged me, doubted me, berated me (for not posting in a timely manner) and overall supported me. For those who I’ve inspired, please know that YOU have been my inspiration…my creative fire. Thank you all!!! This year you will still see me post regularly, however, it’s time for KnottyLoop to add new challenges: to get published, to finally have a class (share information); to make more videos… there is so much on the horizon! I look forward to continued growth of both Mona and KnottyLoop with zest. May we all have an Enjoyable and Prosperous New Year!!! Okay, I’m delinquent! 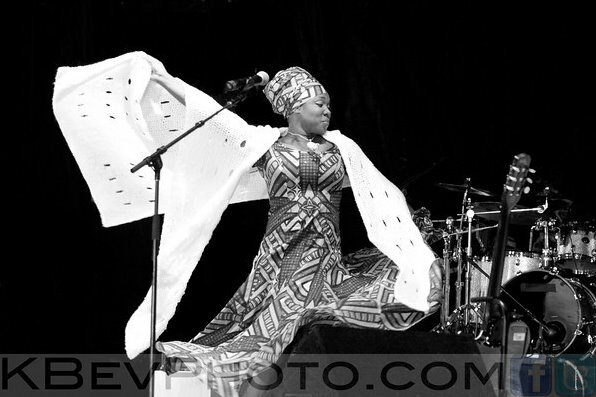 I know you don’t want to hear the excuses, so I’ll spare us all by not mentioning how busy my summer has been with vending shows, looping, fashion shows, looping, grandkids, the gym (trying), concerts, picnics, designing, looping some more, Art shows, Jazz shows and then there was India Arie! 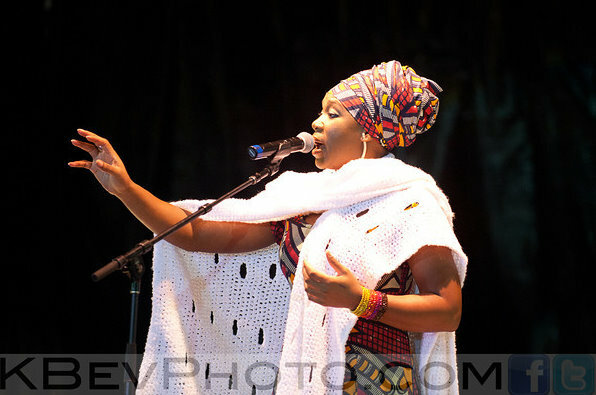 The India Arie experience took up a couple of weeks in just pure excitement; meeting her at the African Festival of the Arts was one of the highlights of my summer, the fact that she proclaimed to love my product gave me joy…and knowing that she walked away with a KnottyLoop Creation, delighted me. 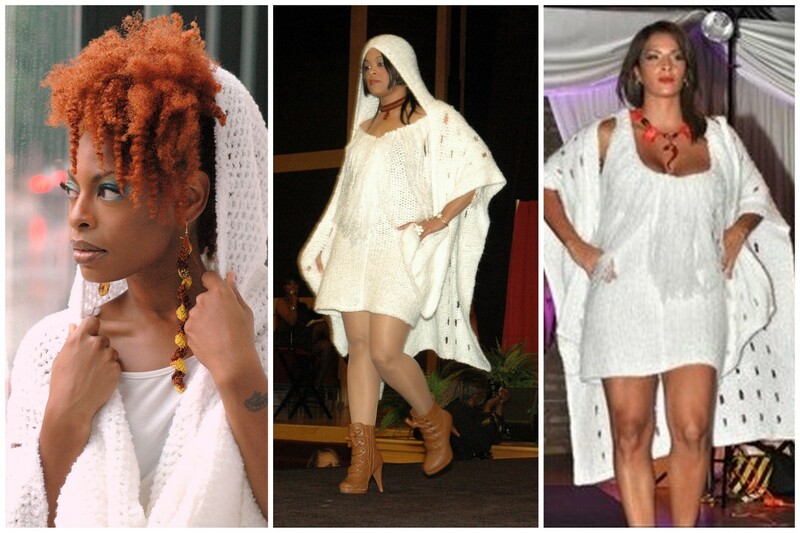 That evening as I was packing up my booth, I got word that she was wearing my creation on stage…Y’all I was FLOORED. This had me jumping up and down like a 4 year old (I paid for this later). The way India worked that white cape after only a couple of hours of ownership was just pure and natural swagger. BTW, I found out this week (2 months later) that she was spotted in Maryland still wearing the cape. *Doing the happy dance*! Anyway I’mmmmmm Back!!!! And looking forward to a great season. I was driving down my block 3 weeks ago and the view was breathtaking; the trees were in full costume bowing in the wind in various shades of gold and green and all I could think was “Wow” these leaves are in the Autumn of their life and they are really showing their swagger. I think for a moment I was jealous. I wondered what does my swagger look like. It has to be natural, you can’t create it, natural swagger is what it is! Our personal swagger might not be as evident as India Arie or the person next to us…but we all have it…NO doubt. I have new designs dripping out of my fingers….Knottyloop is about to strut her swagger. Stay Tuned! Eisenhower Tower (Northeast corner of I-290 & 1st. Ave.
Prioritize, Evaluate, De-clutter and Refresh! As I write this it’s a gorgeous summer day; 75 degrees and just a slight breeze. The Chicago area has had a slew of +90 degree days with more predicted to come. So I’m going to enjoy this while I can. 2 weeks ago I was visiting Wisconsin Dells with my family. It was a wonderful time. I receive a call on the 3rd day at 8 am from some friends letting me know that my home might’ve taken on water…oh well I thought, nothing I can do about it; I’ll deal with it when I get home. After a 5 hour (normally 3 hours) ride home thru heavy traffic and flooded streets, I got home only to find that like most of my neighbors in the Bellwood / Westchester area that I had standing water in my basement. Now I can say that I secretly hoped that I was spared, so I wasn’t quite prepared for what I saw. My initial thought was that my home would never be the same. It wasn’t until I saw my son’s wedding pictures float by did I realize what a sense of loss I felt. After a brief period of feeling defeated it was time to get to work. It has been 2 weeks of hauling, cleaning, bleaching, mopping and de-cluttering (special thanks to my family / friends for all of your help). Thankfully, I had my precious yarns stored in an area that remained dry…but everything wasn’t stored where it should’ve been so I did lose a modest amount of yarn and some works in process. Overall this experience has had a surprising impact on my life. I had many items that I couldn’t part with for one reason or another; I would dust it and move it or move it because it needed dusting. It’s amazing to me how quickly those items became trash when it was covered in sewage. I realized at that moment how much of my precious life was being spent taking care of knick-knacks, in comparison was I giving enough time to the real treasures in my life? This month Ms. KnottyLoop is not promoting. You know what I do and where to find me (I hope). I just want to get a simple message out; Prioritize, Evaluate, De-clutter and Refresh! That’s my new mantra. I’ve began working earnestly in pulling together my new looks for the fall. I plan on having my first trunk show in October of 2011 as KnottyLoop will be celebrating its 5th Birthday. So we will be partying. I’m looking to achieve a look with impact; I’m trying to find a perfect balance that will resonate with harmony between the yarn and the style. Anyone who knows me will tell you I have bins of yarn, one of the reasons for this (beside the fact that I’m addicted) is that I’ve tried certain yarns and they did not provide the look, response (movement) or feel for the item that I was trying to create. So the yarn gets benched for awhile and sometimes I actually come back and retry it for another project and it’s perfect. There are harmonies in all that we do. Look for it in the things that you do. Recognize and embrace them, for these are the things that provide a bit of joy in our day to day lives. BTW: For those of you who follow my newsletters. Keeping true to my last commitment; my bedroom is now painted “Rodeo Red”. Red also stands for passion!! Life is short…break the rules…forgive quickly…love truly…laugh uncontrollably…and never regret that which made you smile. Here are my next scheduled events; I hope to see you there. This is the zone that I’ve been operating in for the past week. Is it because of the weather? Am I trying to cover other issues by staying busy? Or am I just trying to bring to life the ideas in my head? Honestly, I think it’s been a bit of all three. I was standing in line at the grocery store and I looked over and saw the cover of “O” magazine. It asked the question “What’s the next chapter of your life?” I smiled to myself sarcastically and said yeah like I really know. In retrospect that’s the thinking that has kept me where I’m at today…I kind of let things happen and act and re-act as issues and opportunities come along. So after this realization I said to myself, “Self, write the next chapter, put on paper what you want to happen”…begin looping towards that goal. Demand the best that you can offer for yourself. This month is Black History month, what a wonderful time to write my own future story. There are celebrations happening all around the city. Try to get out and take the family. Learn while singing, dancing and celebrating. Enjoy! What color is your summer? The height of the summer fashion season is upon us, beach wear, shorts and tank tops presented in punches of vibrant colors and neutral palettes, lightweight cottons that breathe and colors that energize you once you adorn them. As we bid farewell to spring and think ahead towards a fruitful summer, it is time to free yourself from the weight of heavy winter attire and to bust out in our summer splendor. I can’t but help to wonder, what colors do you associate with summer? I think of Watermelon Reds, Lemonade Yellows and Sunset Corals. I visualize days many years ago that I sat under the huge tree in my grandparents backyard in South Carolina. It was there that they bought the watermelons straight from the garden and cut them on an old rickety table lined with newspaper. It was there that my mom and aunts would bring out glasses of fresh squeezed lemonade in glass jars (and hot dogs) for lunch while we played in the sand and it was there that I remember watching my first sunset, where the sun was huge on the horizon and the very air seem to burst into a beautiful hue of coral. My grandparents have transitioned, a storm came along and toppled the tree and the table never really had a chance…but these memories stick with me. Wonderful summers which helped me become the person that I am today; both the good and bad. Send me an email (knottyloop@gmail.com) with your color combinations and let me know what particular colors remind you of summer and why. If I use your color combos then the item that I create will carry your name for the rest of our Knottyloopish time together. I’ll try to share your stories in the July newsletter. Treat July like your personal New Year, resolve, rejoice, revitalize, renew and refresh. Knotty Loop was featured on “Career Detours” and interviewed by Leah Hope from ABC7. If you missed it, you can see it here!!! !